Synopsis: Kimri is used to betrayal. Her brother sold her to a king in exchange for swords to defend his lands. King Tathan's reputation is as fierce as that of his mountain kingdom—where dragons are said to guard the castle walls—but the realms are unstable enough without angering the mountain-king, so Kimri reluctantly agrees to the union. When she arrives in Helsmont, the king promises her a year of courtship before marrying—or parting ways. Before long, Kimri thinks she may find comfort, and perhaps eventually love, with the stoic king. 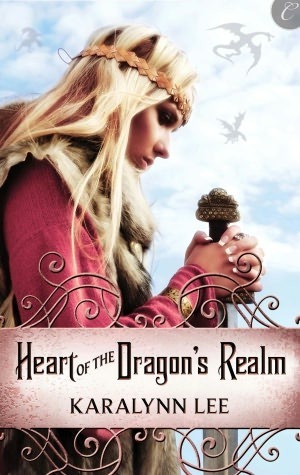 But the realms are more unsettled than Kimri realizes, and she soon finds herself caught in the middle of a war between the kingdoms. Can she count on her betrothed to take her side? Or will his loyalty to his kingdom come before his loyalty to her? A brief but entertaining fantasy romance. This was a short and sweet love story—only around 50,000 words or 142 pages on my eReader, but it was a really enjoyable read and would make a perfect palate cleanser in between books, or just when you want to read a historical fantasy romance but don't feel like starting a 600-page whopper. Although, like most novellas and short stories, it lacked in certain areas such as depth of characterisation and world-building. I almost wish this had been longer even though I enjoyed it for the sweet morsel that it was. I found I really liked Lee's writing style—it was very readable, warm and engaging—but I would have loved more details on the setting and a few more intimate, romantic scenes would have been nice, too. It was very chaste for a romance. In fact, the H and h spent a lot of the book apart for one reason or another, and for that reason, I felt like I never really got to know Tathan, the hero, very well as it's told predominantly from the heroine, Kimri's, perspective. It's set in a historical setting, but exactly where or when I couldn't tell you as those details aren't provided. I'd say it had a medieval feel to it. The fantasy element is minimal but added a nice flavour. It's the story of an arranged marriage between the stoic, gentle mountain-king of Helmsmont, and the feisty princess of neighbouring Anagard, who is, much to her dismay, sold to him in matrimony by her brother the King for the princely sum of 100 swords, 1000 arrows, and the promise of an alliance between the two lands. The land of Helmsmont was a charming place to explore. From its customs (the Sword dancing!) to its people and the informal way they treat their sovereign, something so different to what Kimri is used to. And then there's the man himself, Tathan. He was a revelation, both to Kimri and to myself. Not your typical hero, he's described as a large-boned, slightly greying man with a "rugged" handsomeness. He may not sound like a totally hottie, but it makes such a refreshing change from endless descriptions of rippling abs and chiselled cheekbones blah, blah, blah. I really liked him. It's his gentleness and patience that make him a worthy hero, not just his looks, but as I said earlier I wish we'd seen more of him and that he'd taken a stronger stance where Kimri was concerned. All together, a sweet, easy and enjoyable read. Recommended. Great review! It's nice to have a "palette cleanser" as you call it every once in awhile. And a short high fantasy? That NEVER happens. :D I'll TBR it. Thanks! The Fantasy element was minuscule, it was more a medieval romance with a twist but it was still good!